Greenway Health will close its office in Lake Mary, FL, laying off 27 employees in a process that will kick off in late April. I can’t determine if this is part of the restructuring announced late last year that involved plans to close its Atlanta office and move some jobs from its former Carrollton, GA headquarters to Tampa. The local paper also mentions the company is in the process of closing down operations in Birmingham, AL. 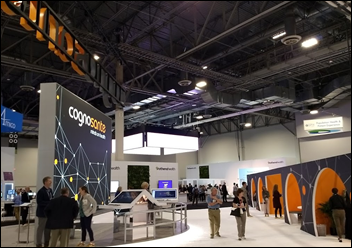 Greenway announced at HIMSS that it has completed the first phase of Project Polaris, a two-year initiative that will result in the consolidation of its three software systems into one EHR and PM tool. Also, Lorre is still offering her “Cellar Dweller Special” for our Hall G neighbors at HIMSS who want to sign up as a new sponsor. A year online is better than three days in the basement. Contact her for details. Millennium Physician Group (FL) selects population health management technology from Lightbeam Health Solutions to better care for 170,000 patients across seven ACOs and six Medicare Advantage plans. Rev360 adds secure credit card payment processing capabilities from Bluefin Payment Systems to its optometry-focused EHR. Modernizing Medicine adds PACS connectivity from Ambra Health to its EMA EHR for orthopedics. Eye care nonprofit BostonSight will offer peer-to-peer consult services to its network of participating physicians via the PeerMed telemedicine service from CoolDoctors. In an effort to attract new patients, the high-tech Forward Clinic gives out genetic testing kits to consumers who book tours of its membership-based primary care practices in San Francisco and LA. Former Uber CEO Travis Kalanick joins Kareo’s Board of Directors. Kalanick’s ties to Kareo go back for quite awhile. He and Kareo founder Dan Rodrigues were classmates at UCLA and co-founders of a late-90s search engine network company called Scour. Kalanick made an early-stage investment in Kareo in 2009, which helped to springboard the Irvine, CA-based company to VC funding of over $125 million. Rob Reid (Listen.com) has also joined the company’s board. Occupational healthcare provider Concentra makes telerehabilitation visits available to California-based employees in need of physical therapy for workers’ compensation injuries. Is there an ICD-10 code for this? 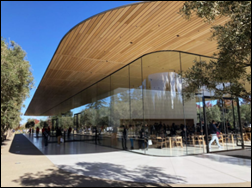 : Apple employees make several 911 calls after colleagues walk into glass walls at the company’s new, $5 billion spaceship-like campus in Cupertino, CA. Apple’s forthcoming onsite health clinic won’t likely see many injuries of this type. The emergency calls tapered off after the glass partitions were marked with white stickers. 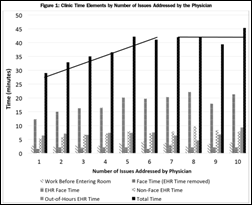 A time-motion study of EHR use in primary care clinics finds that providers spend more time working in the EHR than they do with patients during appointments. Providers gave patients non-EHR face time for only 16 minutes of the average 36-minute appointment. Programming Note: #HIMSSanity is already setting in, with my inbox piling up with last-minute vendor meeting requests and press releases. HIStalk Practice will not publish next week, as I’ll be covering HIMSS18 over at HIStalk.com. Twice weekly posts will resume the week of March 12. 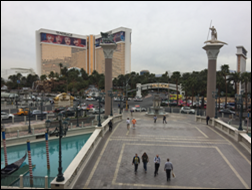 For those who are heading to Vegas for health IT’s biggest event of the year, be sure to check out HIStalk’s Guide to HIMSS18 – your directory of 100+ vendors and their plans, giveaways, and networking events. Also, stop by and see the HIStalk team at booth 11228. I hear we’re in Siberia this year, so friendly faces will be welcome. 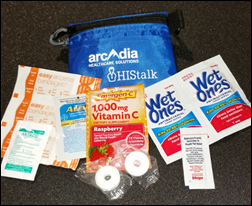 Plus, we’ll have those handy survival kits from Arcadia on hand to help get you through the long days of demos, educational sessions, and exhibit hall walkabouts. 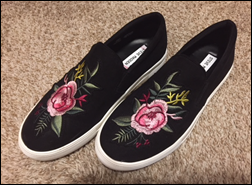 I think most HIMSS attendees know that comfortable footwear (such as the pair I purchased above) is a must, but what about our other attire? A friend working in the vendor trenches is conducting an informal poll to help guide the fashion choices of a new employee who’ll be heading to HIMSS for the first time. (Apparently there has been some water cooler talk about the popularity of jeans over suits.) You can weigh in with your opinion here. Healthwise promotes Elizabeth Beem to CFO. Lyle Berkowitz, MD (Northwestern Medicine / Healthfinch)) joins MDLive as CMO and EVP of product strategy. In an effort to streamline e-prescribing workflows, Maryland’s CRISP HIE will integrate DrFirst’s mobile medication management app with the state-based PDMP, which it operates. Maryland prescribers will be required to review PDMP data before prescribing an opioid of bezodiazepine starting July 1. Aprima Medical Software selects ChartSpan Medical Technologies as one of its primary CCM partners. 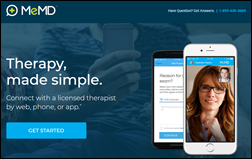 Membership-based primary care provider MDVIP begins rolling out a branded patient app developed by Medfusion that includes messaging, payment capabilities, and health records access. Capital Digestive Care implements GMed’s cloud-based EHR for gastroenterologists across its 28 locations. MeMD adds behavioral healthcare to its line of telemedicine services for consumers and employer groups. The company tapped Mdlogix to help it develop its behavioral health assessment. Teladoc reports Q4 revenue of $77 million and full-year revenue of $233 million. 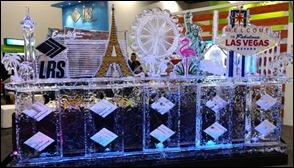 Quarterly and yearly visits both increased by close to 50 percent. The company’s acquisition of Best Doctors last summer contributed to strong gains in subscription access fees. Healthwise publishes its patient education app on Epic’s App Orchard. AdvancedMD will exhibit at the American Academy of Orthopedic Surgeons conference March 6-10 in New Orleans. Culbert Healthcare Solutions will exhibit at the AMGA 2018 Annual Conference March 7-10 in Phoenix. EClinicalWorks launches a cloud-based hospital EHR/RCM system that will start at $599 per bed per month with no upfront capital cost. Revenue cycle technology company R1 RCM will acquire Intermedix’s healthcare division, which includes physician and EMS RCM, practice management, and analytics service lines, for $460 million. R1 President Joseph Flanagan believes the acquisition will give the company better leverage in serving the physician practice networks of its hospital customers. And speaking of hospital customers, Ascension (MO) has decided to expand its contract with R1 RCM to include its medical group, which has facilities in 22 states. US Vision and its Nationwide Vision affiliate implement First Insight’s MaximEyes EHR at 100 locations, with plans to go live at their remaining 500 US locations within the next two to three years. In an effort to help community providers more easily exchange health data, DSS will embark on a Direct Messaging pilot program with The Sequoia Project’s EHealth Exchange data-sharing network. The pilot will give federal agencies on the exchange access to Direct addresses of physicians and hospitals in rural areas. Healthcare Administrative Partners hires Rick Grodin (Premier Urgent Care) as EVP. Scott Howell, MD (Heritage Provider Network) joins Advantmed as CMO. Orthopedic care management company SwiftPath develops a telemedicine service line for patients undergoing and/or recovering from outpatient joint replacement. CMS invites physicians to participate in a year-long study of burdens associated with the reporting of quality measures in exchange for full credit for the 2018 MIPS Improvement Activities performance category. The study will study clinical workflows and data collection methods using different submission systems, seek to better understand physician challenges associated with collecting and reporting quality data, and recommend changes to reduce burdens and improve reporting and care. Applications are due March 23. 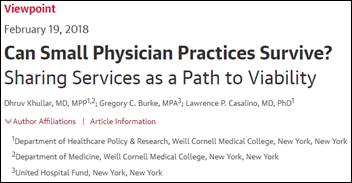 The New England Journal of Medicine observes that ACOs made up of independent primary care practices are more nimble, interested in experimentation, and focused on resource conservation than their larger, hospital-affiliated peers – qualities that have, in fact, led to greater savings. Money, being the great equalizer that it is, was cited as the biggest pain point for ACOs looking to purchase analytics tools and more robust EHRs. A consequential lack of interoperability also reared its ugly head. The study’s authors point out that IT investments don’t have to happen right off the bat for success; an emphasis on leadership, staff roles, and building relationships with participating practices should be first priority. This survey finds that provider interest in implementing patient payment portals has jumped from 40 percent to 63 percent in the last year. I blame my health IT bubble (and penchant for Amazon-like retail experiences) for being surprised that there are healthcare organizations out there that haven’t yet invested in consumer-friendly payment tech. 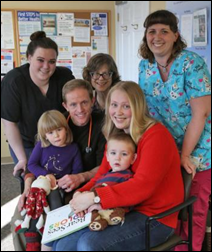 No technology needed: Lincoln Medical Partners (ME) gives away its 20,000th free book to a two year-old patient through the statewide Raising Readers program, which promotes early childhood literacy through book donations to children at birth and annual well visits. PCPs also spend time with parents discussing the benefits of reading aloud to their children. I get the feeling that it’s becoming a lost art as devices seem to take over many of the more traditional social interactions. EClinicalWorks posts customer success stories for Petaluma Health Center (CA) and Prime Care Family Practice (VA). Idaho Business Review profiles Healthwise SVP of Consumer Health Experiences Christy Calhoun. Practice Fusion will soon start charging providers for its EHR software, which has thus far been free thanks to revenue gleaned from embedded pharmaceutical ads. Providers could see monthly subscription charges of $100 as early as next month, according to a company spokesperson who did not indicate if the ads would remain. The decision comes six weeks after Allscripts announced it would acquire the company for $100 million – a fraction of its former valuation. Competitors have been quick to chime in, pointing out that Practice Fusion’s changing business model makes for an opportune time to look for new solutions. Others wonder if the company will flip to a data-selling model akin to Flatiron Health. In an effort to tap into the healthcare market, EnterBridge Technologies acquires healthcare analytics and benchmarking business SMA Informatics Partners. 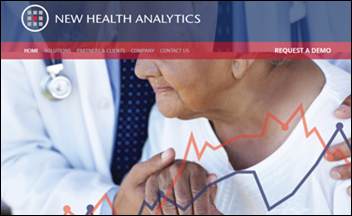 It has named the newly combined company New Health Analytics. EnterBridge co-founder Todd Nuckols will become CEO of the 10-employee company. Hands On Technology will integrate Ability Network’s RCM application into its TheraOffice rehab EHR/PM. Apex Revenue Technologies adds expanded physician branding capabilities and more custom patient payment options to its MySecureBill software. NextGen will add OptimizeRx’s prescription messaging service to its EHR next month, alerting physicians in real-time to prescription savings and educational content. Amion adds PerfectServe’s clinical communication and collaboration platform to its physician scheduling software. Fertility Pro adds Azalea Health’s RCM capabilities to its EHR for fertility specialists. This year’s record flu season prompts Teladoc to provide over 300,000 virtual consults in the last five weeks. Flu cases accounted for 1 in 5 Teladoc visits in the peak month of January – quite a bit higher than the CDC’s reported 1 in 15 in-person visits for the same time period and perhaps a solid indicator that providers and patients are turning to telemedicine before darkening the doors of germ-ridden clinics. Recent reports indicate the flu may have plateaued, with the season expected to possibly last into May. PlushCare offers allergy sufferers advanced diagnostic tests from Thermo Fisher Scientific and participating labs as part of its virtual consult services. Researchers determine that retrospective claims data is more beneficial than EHR data when predicting a patient’s medication adherence. Prescription fill gaps of at least six days were found to be the biggest indicator of a lack of future adherence. A JAMA editorial highlights the ways in which small physician practices can leverage service-sharing arrangements in an effort to keep their doors open and patients well-cared for. While these types of arrangements have been around for several years (if not longer), they are experiencing heightened interest as today’s practices struggle with burdensome regulatory programs, IT costs, decreased reimbursements, and burnout. The authors suggest that, though many questions remain related to ROI, such arrangements may be the best bet for practices who want to stay afloat. By eliminating these time-consuming tasks, healthcare employees will be able to spend more time building relationships with the people who matter most — patients. According to the Association of American Medical Colleges, it is anticipated that the US will face a physician shortage of up to 88,000 doctors by 2025. With burnout rates for physicians already hovering above 50 percent, these added demands will only add to their burdens. AI is one way to reduce pressure on physicians while improving clinical care. AI makes decision-making for complex care treatment much easier. We live in a world with an ever-growing number of diagnosable conditions as well as patients that now have two, three, four or even more diagnoses. With literally billions of people (and almost as many medical conditions), there are an infinite number of possibilities of overlapping diagnoses. Treatment that may work for one patient may not work for another. This puts a huge burden on physicians and can negatively impact outcomes for patients. AI, used in conjunction with a physician’s care, can help with this challenge. AI systems can now use algorithms to analyze data based on treatment decisions that have been (and are still being made) throughout the world. Add to that data analysis the ability to continue to learn and apply predictive analysis, and it’s easy to see how AI will begin to help practices provide higher levels of safety and quality for their patients while potentially reducing the workload of physicians. At first glance, AI seems to have the most application for physicians. However, it also provides ample opportunity to improve the patient experience. Today’s patient has high demands of their provider — demands that are often difficult to meet. AI is one solution. Patients are already interested in medical-based AI. A study found that, as of 2016, 54 percent of patients were willing to embrace AI and robotics in their healthcare, and that number is growing every year. What are some examples of what AI can do for patients? Improve outcomes—there are currently medical apps like PeerWell that help patients take a proactive role in their own care before or after surgery. These programs give patients specific daily plans for care. As the patient enters their information each day in the app, the program can make adjustments to their recovery plan based on the results. Enrich communication—AI offers the potential to reach out to patients in a much more detailed and individual way. Through machine learning and AI algorithms, practices can easily reach out to patients when and how they prefer with more customized communications, whether it’s for simple reminders or diagnosis-specific education. AI is an incredible tool to help meet the evolving complexity of healthcare and needs of modern patients. Despite all the hype, AI will not replace physicians, but instead enhance the quality of care offered by them. As Wipro CTO K.R. Sanjiv put it, "While it can learn on a basic level, AI doesn’t rise to the level of human intelligence or pose a meaningful threat to human workers. Once you understand what you can’t solve with AI, you’ll see just what you can." AI will not dehumanize the healthcare experience; instead, it will provide a more detailed and personalized experience for all involved. While AI itself may not directly threaten a doctor’s job, experts warn that physicians who take advantage of AI will eventually place physicians without AI technology at a significant disadvantage. Similarly, healthcare systems that are integrated with AI will eventually replace those healthcare systems without. Integration will become a necessity, not a luxury. As with all technology, it is important to balance the benefits of AI with the vital need to engage and connect. Finding ways to leverage AI in order to put more of an emphasis on the human component of healthcare is key to long-term success. Jim Higgins is the CEO and founder of Solutionreach in Lehi, UT.